WCPO.com | 9 On Your Side - coverage of the 95th annual Findlay Market Parade. Video coverage from Music Hall and The Banks. 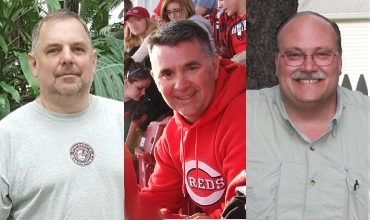 Our primary photographers since 2011 are (shown above left to right) Jeff Gladish, Ron Murphy and Ed Ferrall; Raymond Gordo was added for 2015. Jeff Gladish, of Gladish Solutions, has created and updated the Findlay Market Parade website, since late 2009. He also is the Findlay Market on-field photographer for the Opening Day Findlay Market presentation of the basket to the Cincinnati Reds Manager, a tradition since the 1920s.